Recently Delta posted about games-within-games. The idea is not new to me, if you've played any CRPGs in the last decade, they seem to have grasped this concept. An example is spell making or alchemy in Morrowind. Or, the Pirates! examples he mentions in his post. What is new to me is the idea that this could work in Swords & Wizardry, not just to provide a player with an interesting sub challenge, but to simulate, or at least elicit the flavor of systems that the core rules would have a hard time handling. The rules may be able to handle it but if a subgame handles it more abstractly and quickly it might make for a better overall player experience. The players in my recent S&W session seemed to get very excited rolling up hirelings. We could very easily roleplay the whole process, but with Bulette's generator, they were able to achieve results quickly in a way that was fun for them. I think it would have been difficult to roleplay the search for hirelings in a way that would have had as much tension and involved all the players. I'm not saying it isn't possible, but that it would have been difficult. So, knowing that the goal is to speed up results while retaining tension and fun, what are some possible targets for designing subgames? Mass combat has been acknowledged for a long time as a seperate layer of abstraction. A zoomed out game, if you will. But what about others? Delta mentions trade and diplomacy systems from modules I've never encountered. I would be really interested to incorporate more of these types of elements into play. Here is a possibility I thought of last night: Village Defense. 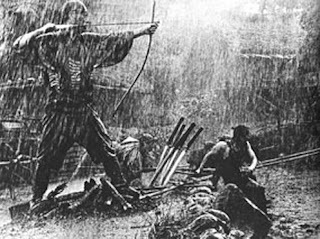 I was introducing my father to the Seven Samurai and realized how it would be difficult for me to simulate the exciting back and forth of: "they're over here . . . they're attacking form this side now." I don't think mass combat rules like battlesystem or chainmail would capture the small scale of the drama, or the sense that everything rests on a few players actions. 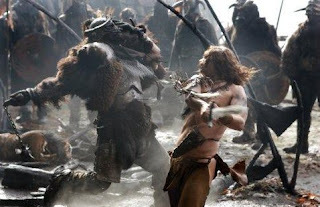 The 13th Warrior has a similar situation. I have too much on my plate right now, but a smooth, simple defense of a small area subsystem would be a cool thing to look into. Anyone want to give it a shot? Thanks for the heads up! From my brief glance, that looks like they're trying to create their own set of miniature wargame rules-- like Chainmail, or the later, Battlesystem. What I have in mind would be much simpler, and quicker. Almost like a speed card game, where you have to play your resources in the right places at the right times. Maybe matching Hit Dice or weapon damage versus the attackers' etc.